Sanlúcar de Berrameda-Bodegas La Cigarrera is located in the heart of Sanlúcar de Barrameda. 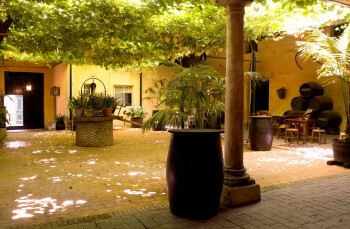 This almacenista began operations in 1758, and cellar master Ignacio Hidalgo began bottling his own Manzanilla in 1997. Ignacio is a ninth-generation cellar master, whose family’s wines were previously sold to famous Sherry houses, including Lustau, for bottling. La Cigarrera refers to the cigarette/tobacco women who used to sell on the sidewalks of Sanlúcar. It is a tribute to the pride, beauty, and history of this town. The key to the quality of La Cigarrera is the exceptional raw materials and the location of the winery. La Cigarrera Manzanilla is produced exclusively in the town of Sanlúcar de Barrameda, in the Barrio Bajo sub-zone. The unique microclimate of Sanlúcar de Barrameda creates a very special “flor”, or yeast, that grows year round on the wines, protecting them from the atmosphere. Hence, the wine goes through what is termed a “biological aging,” with the wine aging and breathing through this layer of yeast. Pair chilled with oysters and fried smelt & sardines.